Ty Cobb is regarded by some as the greatest all-around baseball player who ever lived. During his career, Cobb set dozens of records, including lifetime batting average, which still remains unbroken. Tyrus Raymond Cobb was born on December 18, 1886, in Narrows, Georgia, to William Herschel Cobb, a school administrator and state senator, and Amanda Chitwood. Cobb grew up in Royston, Georgia, and began playing sandlot ball (playground baseball) as soon as he could swing a bat. While his father wanted him to pursue an academic career, Cobb was determined to make it as a professional baseball player. In 1904, despite family objections, he signed with the Augusta baseball team of the South Atlantic League and soon attracted notice. Cobb's aggressive play won him a contract in Augusta that would pay him $125 a month. Grantland Rice (1880–1954), the famous sportswriter, saw him play for Augusta and named him the "Georgia Peach," a title that Cobb wore proudly. At a time when pitchers dominated the game and batting averages were low, Cobb was a brilliant exception. He hit .326 in his last season in the minors before joining the Detroit Tigers of the American League on August 27, 1905. In 1906 Cobb hit .320, the fifth best average in the league and 35 points ahead of anyone else on his team. The next year he won the American League batting championship, hitting .350 and leading Detroit to the World Series. He quickly became the biggest attraction in baseball and would hit .300 or better for twenty-three straight years. During that time, he hit over .400 in three different seasons—his all-time high being .420 in 1911. Cobb led the league in hitting twelve times, nine of them in a row. During his peak years, 1909 to 1919, he so dominated baseball that historians refer to it as the era of the "Cobbian game." In 1909, for example, Cobb had the best year of any baseball player to that date, leading both leagues in hitting with an average of .377 and leading the American League in every offensive category. Once again he led the Tigers to a pennant (league championship), though they lost the World Series. As most of his teammates were markedly less talented than Cobb, he would never be on a world championship team, about the only honor available to a ball player that he did not win. 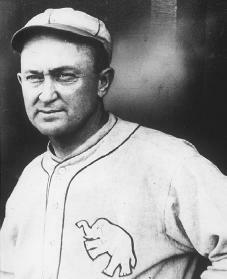 This remained so even during his years as a player-manager for Detroit from 1921 to 1926, when the team never finished better than second place. Cobb, in addition to his batting skills, amazing fielding, and talents as a base runner, was the fiercest competitor in baseball. Not satisfied with simply winning, he had to run up the highest possible score and therefore put ruthless pressure on the opposition until the last man was out. A perfectionist in an era of what was called "inside baseball," which emphasized hit-and-run plays, base stealing, and bunting, he mastered every aspect of his craft. Cobb was also a supremely intelligent player, a kind of baseball genius. "Know thy enemy" was his guiding rule, and his thorough knowledge of every competitor enabled him to "read" the opposition as no one else could. The reasons why Cobb's intelligence was so much admired in his playing days can be read in his autobiography (a book written by a person about their life). The chapter on hitting is a brilliant essay on how to keep the opposition off balance by never doing the same thing twice. "I tried to be all things to all pitchers," Cobb wrote, summing up his teachings nicely. If that chapter is all about technique, the next one, "Waging War on the Base Paths," is all about psychology (the study of mental behavior). Once Cobb, annoyed by a catcher who was always telling journalists that Cobb's reputation was overblown, performed an astonishing feat. On stepping up to the plate, he told the catcher that he was going to steal every base. After singling to first, Cobb then stole second, third, and home on four straight pitches. more than strategy. But the new "Ruthian game" was not to Cobb's taste, and although he remained a skillful batter, his legs began to give out. In 1927 Cobb signed with the Philadelphia Athletics, and even though he averaged .357 at the plate, it was clear that his days as a player were numbered. He spent most of 1928 on the bench and retired at season's end. When Cobb left baseball, he held forty-three records. Although all but one have since been broken, his fantastic lifetime batting average of .367 appears safe. That he was the best all-around player who ever lived was recognized in 1936, when he led everyone in votes for the first group of Baseball Hall of Fame inductees. He came in ahead of legends Ruth, Honus Wagner (1874–1955), Christy Mathewson (1880–1925), and Walter Johnson (1887–1946)—the other four original selectees. As a player Cobb was godlike, but as a man he had little to offer. Angry, ready to argue, touchy, and a loner, his teammates at first hated him for what one of them called his "rotten disposition" (bad attitude). He was tolerated only after his value became obvious. A bully on the field, Cobb was also the same off of it. In a racist age (a period where many believed one race was superior to another) he was notably abusive to African Americans. Cobb was a poor husband and father too. Both his marriages ended in divorce, and even though he had five children by his first wife, his relations with them were not close. As sometimes happens, he did better as a grandfather. Like many ex-athletes, Cobb was restless in retirement, living simply despite his wealth—much of which he gave away. In 1953 he founded the Cobb Educational Foundation, which awarded college fellowships to needy Georgia students. Among his other charitable works was the hospital he built in Royston as a memorial to his parents. Cobb died in Atlanta, Georgia, on July 17, 1961, widely admired but not loved, unlike the other great ballplayer of his time, Babe Ruth. Alexander, Charles C. Ty Cobb. New York: Oxford University Press, 1984. Cobb, Ty, and Al Stump. My Life in Baseball. Garden City, NY: Doubleday, 1961. Creevy, Patrick. Tyrus. New York: Forge, 2002. Stump, Al. Cobb: A Biography. Chapel Hill, NC: Algonquin Books of Chapel Hill, 1994. I read a book about Ty Cobb over 30 years ago. The book described Ty's father as an alcoholic. The movie they made about Ty showed him as a drinker. The book did not make mention of any abuse towards his wives. Clinton, Hillary Rodham Cole, Nat "King"